Everything you need to know about the new iOS email app SquareOne is in the above photo. That’s the home screen, the first thing you see whenever you open the app. Notice the little numbers in the corners of the boxes? 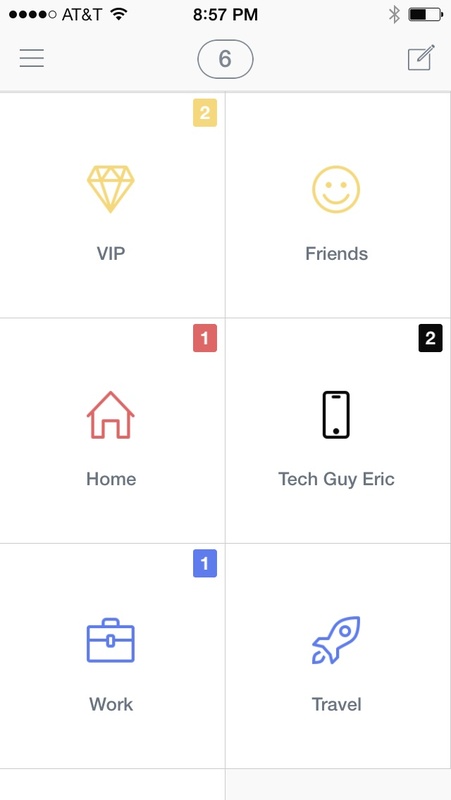 Those are the numbers of unread messages in each of those categories, and clicking on a square will only show you the messages related to that topic. How does the app know where each message goes? The very first time you open the app, you’ll see all your messages in the “Unsorted” folder. A simple swipe to the left allows you to select the folder where a particular message belongs. From that point on, whenever that sender emails you something, their message will go straight to that folder. You don’t have to do anything else. As new people email you, you only have to sort them once. The app will take it from there. SquareOne doesn’t mess with any of Gmail’s own file structure. When you sign into Gmail from a computer, you’ll still see all your messages as you normally would with no new folders or rules or anything added. That’s handy because if you decide to stop using the app, you aren’t stuck having to undo all the damage it’s wrought. The flip side, though, is that if you use Gmail’s own preferences to filter your messages at the server level, SquareOne will not recognize them. In fact, the app only sorts messages in your Gmail in-box, so the contents of any other folders you’ve manually created (via the web interface) will be ignored. The composing and reading windows look just like any other email app, nothing special there. But that’s okay because for me, those actions don’t need improving. — You can create as many groupings as you need/want. — It’s Gmail-only at the moment, but they say support for other email providers are on the way. — It recognizes Gmail’s two-step authorization, if you use it (which you should, for additional security). — When you first connect the service to your Gmail account, it’ll show you a neat “analytics” report for that account: how many messages you receive on average per month, your average response time, and how “overloaded” your in-box is compared to other gmail users. If this is the kind of data that interests you, take note when it first presents itself, because there’s no way to get back to this screen once it’s gone (as far as I can tell). — You can link the app to multiple Gmail accounts. — You can “silence” individual groups so the app doesn’t push you any notifications when certain people email you. — Yes, there’s a way to see all your messages in a single unified in-box for those times when you might need it. I don’t rely too much on my Gmail account mostly because I find Gmail’s web interface to be a tad unwieldy. Even Google’s official mobile app can be annoying. With a streamed-down app like SquareOne, though — which only does one trick but does that trick very well — I can see myself using Gmail more and more.